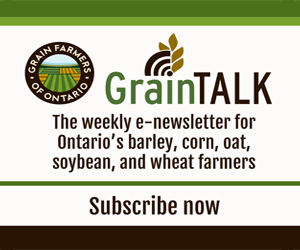 September 2014 Albert Tenuta Cropside, Production Comments Off on Cropside: What’s infecting soybeans? is Ontario’s most important soybean seed disease. It is most problematic when the weather conditions at harvest are warm and wet causing delays in harvest. The fungus overwinters in seed and crop debris. Phomopsis seed mould is characterized by fine cracks of white or grey mould on the seed surface. The yield, grade, viability and vigour of the seed can be reduced. Yield losses occur because severely infected seeds are small and light and may be lost during harvest and cleaning operations. Soybeans destined for export or seed should be harvested first. Seed treatments can help but distorted seed with visible fungal growth often fails to germinate, even when treated. Plant infection is referred to as “Pod and Stem Blight”. infected seed has a distinctive purple discolouration varying from violet to pale purple to dark purple over part or all of the seed coat. This discolourization is often confined to the upper two layers of the seed coat and the embryo is not discoloured or affected. This disease can also cause leaf blighting “Cercospora leaf spot”. The fungus overwinters in seed, but the primary infection source is crop residues. is primarily a concern in food grade or specialty beans which require blemish-free seed coats. Infected seeds have a characteristic brown or black discolouration extending in streaks from the hilum region. The virus survives from season to season in infected seed, therefore, using disease free seed is necessary. SMV is transmitted from plant to plant by aphids. infection can led to uneven crop maturity or “green stem” symptoms. Infected seed coats are mottled with brown or black streaks extending from the hilum. Unlike soybean mosaic virus, BPMV does not spread very efficiently in seed. The bean leaf beetle is its primary vector.